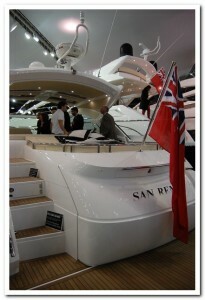 The London boat show has once again sailed into London’s Royal Docks. 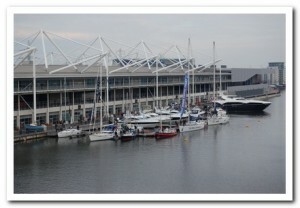 Since its first arrival at Excel in 2004, the show has attracted exhibitors and visitors from far and wide to this waterside location. 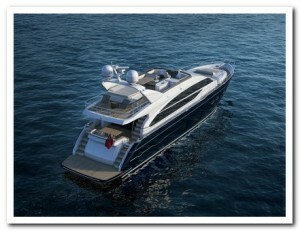 With all major British leisure boat builders well represented, the 2013 show is also an opportunity for several new vessels to make their debut appearance under the exhibition spotlights. First out of port is Sunseeker, who unveiled two of their latest models, an updated San Remo and the Predator 68, whilst Plymouth based boat builder, Princess has sailed the Princess 82 and Princess 52 motor yachts into dock. As a visitor to the show, you are welcomed onboard a number of these yachts and for a few moments, you can dream of a life on the open seas. 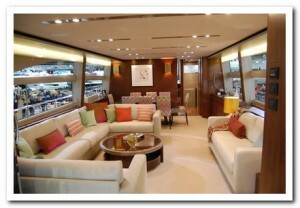 We were kindly given a tour of one of the largest ships berthed in Excel, the Princess 82. With what we can only described as a floating palace, the Princess 82, boasts three decks, a ‘Missoni’ designed interior, bedrooms with en-suite bathrooms with not only showers but a bath too, not forgetting a large lounge that would rival most of the Docklands apartments nearby. 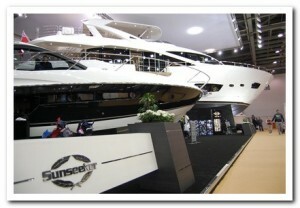 This £2.7m floating palace deservedlyhas pride of place on the Princess stand and is a definite must see. As with such a prestigious show, there was no shortage of luxury items on offer to keep your boat in good company from fine wines to hovercrafts. With the finest of British boats on display, it was good to see that British car manufacturers had also made journey, with both Aston Martin and Land Rover showcasing their finest ranges. A hidden gem at the show is also a recently restored vintage Rolls Royce, which is well worth hunting out. For the nautical bargain hunter, the flotilla of smaller stands offered a good range of boats to accommodate every budget and a selection of show only discounts on the latest innovative boating products. Younger sailors, not yet old enough nor with sufficient pocket money to take the helm of one of the larger vessels, weren’t left out either. Budding sea boys and girls, grasped the opportunity to play captain and test their marine skills, albeit at the helm of a remote control model yacht. The London boat show 2013 is sponsored by Tullet prebon a broker in the nearby City of London and runs until Sunday 20th January, so get there and don’t miss out. If you’re coming to visit or exhibit and need a hotel, check our hotels page for a list of local hotels near Excel.